Solar power from the searing sands of Tunisia to your home in the UK. Who said the Sahara was a desert? Energy intelligence published in its July issue “Tunisia Eyes Renewables, Efficiency as Gas output declines” where it depicts the energy situation in Tunisia and the strategies to face gas reserves decline and energy demand increase. These include renewable energy mix objectives and energy efficiency. As part of Tunisia energy strategy, solar export is being considered through the launch of TuNur project which is currently being considered for an agreement with the Tunisian Government. Dr. Till Stenzel and Kevin Sara, respectively CEO and Chairman of TuNur Ltd, published in The Energy Industry Times an article about the realization of the vision of exporting solar power from North Africa to Europe through the TuNur project. The article explains the advantages of CSP compared to other renewable energy such as PV and wind. TuNur project is the first gigawatt-scale solar export project between Tunisia and Europe which has already achieved major milestones. It is also endorsed by DESERTEC Foundation and already many multilateral banks and strategic equity investors have declared their interest in financing this project. 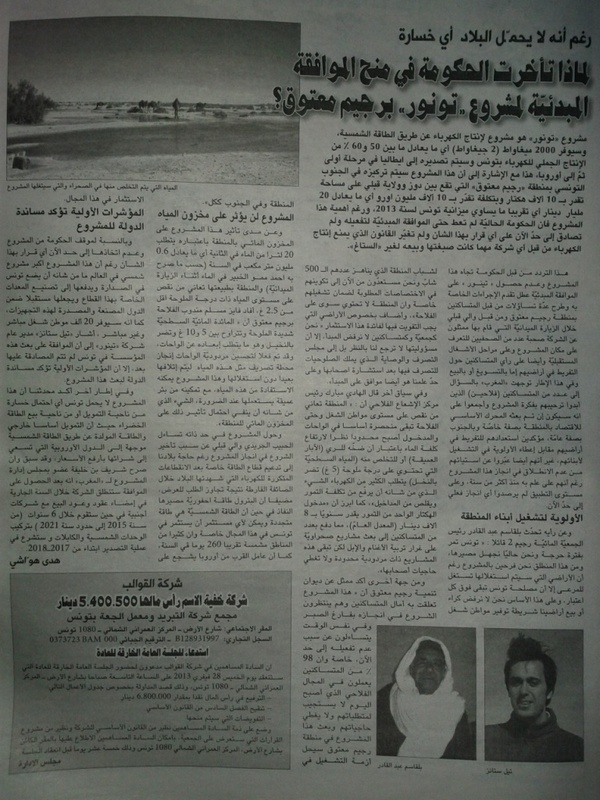 On the 8th of February 2013, Tunisian daily newspapers La Presse and El Maghreb published articles explaining the TuNur project and the technology deployed, clarifying the water and the land issues and stressing on its positive impacts especially environmental and economic. Both articles highlight the impatience and the support of local people to the implementation of the project. Please click here to view the full La Presse article. Please click here to view the full El Maghreb article. 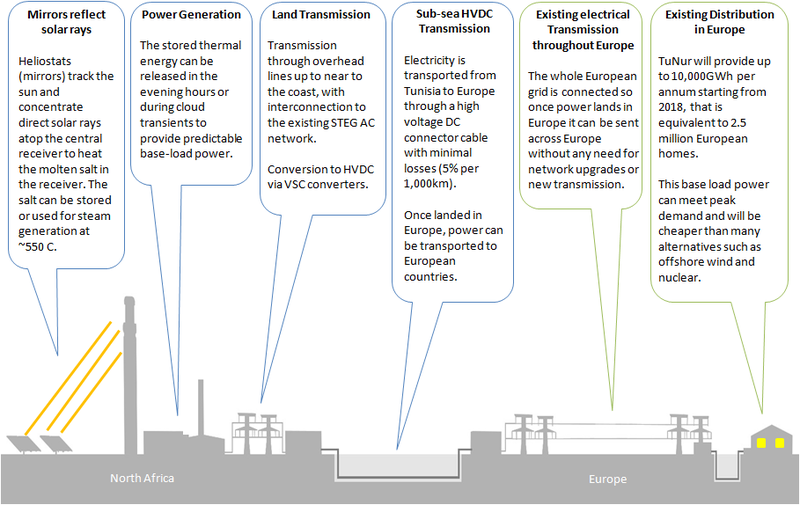 If Europe decides to turn away from nuclear and other sources of energy, as current trends tend to indicate, where will the continent look to power its future? Some say: Tunisia. TuNur, a joint-venture company between NurEnergie, a solar power plant developer based in England, and a collection of Tunisian investors, has seized upon the unmet export market of solar energy from Tunisia to Europe. It establishes the first solar export scheme between Tunisia and Europe. The “EU Grid Integration of Tunisia-Based Concentrated Solar Power (CSP) Plant” study, conducted by TuNur with Imperial College of London and DNV KEMA Energy & Sustainability investigates the impacts of integrating 2GW of electricity generating capacity from TuNur’s CSP power plant in Tunisia into the European electricity system via an HVDC link from Tunisia to Central Italy. The study shows that solar imports from North Africa technically feasible and brings several grid integration benefits to the European electricity system. In the sands of North Africa, the DESERTEC Foundation’s vision for a future where the world's deserts supply clean and sustainable energy to the whole of humankind is beginning to take shape. That future begins in the Saharan deserts of Tunisia with a project called "TuNur". In Tunisia, Nur Energie is developing the world’s first CSP solar export project between North Africa and Europe. Nur Energie has been present in Tunisia since 2008 working with local Tunisian and Maltese partners and investors to contribute to the solar energy industry in the region. The TuNur project consists of a 2,250MW solar CSP power plant in the Sahara desert and a 2 GW HVDC submarine cable from Tunisia to Italy. As the power plants become operational, they will generate circa 9,400GWh of 100% renewable and dispatchable power per annum. 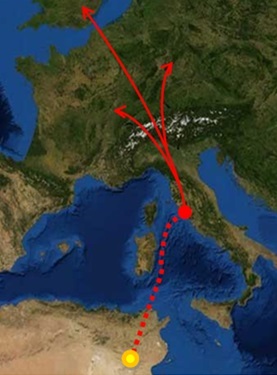 Power is then transported across the Mediterranean Sea to a landing point in central Italy where electricity generated will be transmitted to other European countries such as Germany, Switzerland, France and the United Kingdom. TuNur is an inter-continental project with the aim of filling the renewable energy demand of European countries while also contributing to the development of solar energy in Tunisia and North Africa. In Tunisia the project will contribute to industrial development, improve energy security and will establish expertise in CSP technology and industry in the region. In Europe TuNur can provide benefits by enabling governments to fill renewable energy targets to increase renewable energy generation and reduce carbon dioxide emissions using a reliable source of renewable energy. The site is located in the Sahara desert and has a solar radiation level of 2500 kWh/m2 annually. Nur Energie has built and maintained a solar weather station for 3 years on the TuNur site to receive real time solar data on the ground. Tunisia has up to 20% better radiation than some of the best sites in Europe, and the Sahara desert provides significant land to develop large scale solar power projects. In November 2015 the European Network of Transmission Operators (“ENTSO-E”) confirmed that the TuNur application for the Ten Year Network Development Plan (“TNYDP”) 2016 has been accepted and the project is successfully included in the shortlist. The projects included in the final TYNDP shortlist will be eligible to apply as Project of Common Interest 2017 to get regulatory and financial support from the EU.